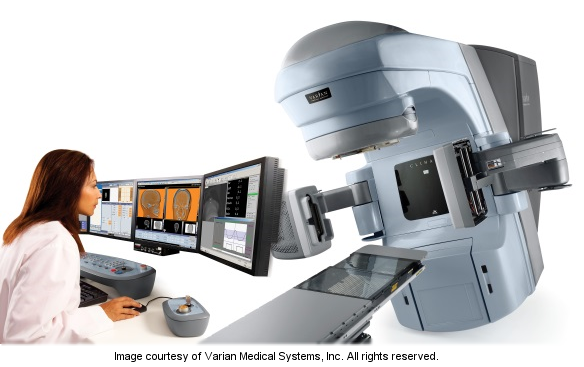 In external radiotherapy, Docrates Cancer Center uses two technologically advanced Varian linear accelerators, which can be used to perform VMAT Rapid Arc radiotherapy. Each external radiotherapy patient at Docrates has access to this modern, high-quality radiotherapy in accordance with a customised treatment plan prepared by our best experts. The plan can be adjusted as the treatment advances in order to ensure an optimal outcome, for example by fine-tuning the placement of radiation as the tumour decreases in size. The plans for radiotherapy constitute a demanding puzzle in which the uncompromising team efforts of our radiotherapy professionals ensure that each patient gets an optimally tailored and effective radiotherapy plan. Docrates Cancer Center is a pioneer in the field of radiotherapy and was the first to introduce the VMAT Rapid Arc technology in the treatment of cancer in Finland. Docrates offers specialised radiotherapy expertise in the treatment of, for example, challenging cases, such as head and neck area cancer. The planning and implementation of radiotherapy require attention to a considerable number of details, which can be optimised in many different ways. Radiotherapy is, in fact, handwork the way surgery is. Although radiotherapy is based on highly accurate imaging techniques and computer-controlled radiotherapy technology, in light of the outcome, the importance of craftsmanship is underlined: how the doctor marks out the radiation area and the areas to be protected, and how the physician, together with the medical physicist, optimizes the dose plan before the final implementation. The VMAT Rapid Arc technique is a combination of the best properties of stereotactic and intensity-modulated radiotherapy. In RapidArc, the radiation dose delivered to the target tissue is maximised and the dose delivered to healthy tissues is minimised: this increases the probability of healing while decreasing the adverse effects of the treatment. With the new technique, inversely optimised dose planning produces the optimal dose distribution between the targeted area and tissues that need to be protected. The treatment is dynamic and fast, which also helps to reduce any inaccuracy resulting from the patient’s movements. In VMAT Rapid Arc therapy, the instantaneous dose rate from the accelerator can be modulated during a rotation so as to optimise the dose distribution to deliver a maximum dose to the target tissue and a minimum dose to tissues to be protected. The radiotherapy device rotates around the patient once or several times (depending on the treatment plan and level of optimisation), dividing the radiation dose into mini-doses delivered from many directions to the tumor, while the thin metal leaves (multileaf collimator) move under computer guidance, dynamically protecting normal tissues. During the treatment, the position of the metal leaves and treatment targeting are computer-guided and analysed. Targeting is essential for an optimal outcome in radiotherapy: the radiation dose delivered to the tumour must be maximised while minimising the dose delivered to the surrounding healthy tissues. We use the treatment device to take x-rays in connection with every treatment session in order to ensure correct positioning and, thereby, optimal targeting. The treatment device can also be used for CBCT, cone beam computed tomography scanning, which is an excellent tool for determining the anatomical structure of soft tissue, in particular. CBCT scanning is particularly useful in targeting pancreas, liver and lung cancer treatment. We use different fixation equipment, such as moulds and masks, to ensure that the patient is in the same position during each treatment session, as far as possible. Some of the moulds are custom-made to patient measurements. We make tattoo marks on the skin of our patients to ensure correct treatment positioning. In the treatment of prostate cancer, we use so-called gold anchors and golden fiducials. These are thin, x-ray-positive threads that are permanently inserted inside the prostate to allow the optimal targeting of radiotherapy in accordance with prostate movements. In thoracic cancer radiotherapy, we have the use of breathing-synhcronised radiotherapy, which observes tissue movements during breathing. 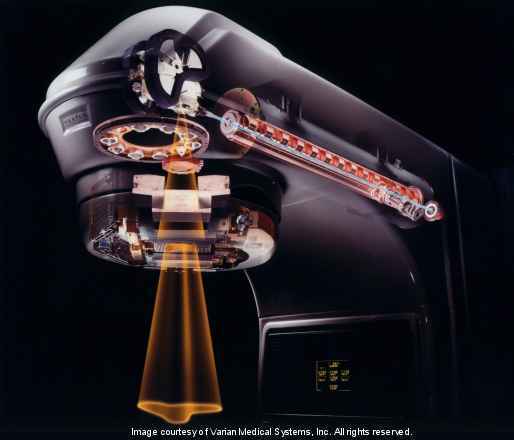 Docrates has two identical Varian Clinac iX linear accelerators for external radiotherapy, with integrated OBI® x-ray systems to enable cone beam computed tomography (CBCT), to ensure that treatment can be administered despite possible equipment failure.